Together, advocates were inspired by dynamic preachers of the Gospel, including Rev. Dr. William Barber, the President of the North Carolina NAACP and convener of the Forward Together Moral Movement, and Rev. Amy Gopp, Vice President of External Relations for IMA World Health. 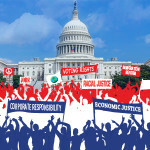 Participants learned about the enmeshed issues surrounding discriminatory polices and practices related to race, class exploitation, as well as voter and other human rights suppression in the United States and throughout the world. Keynote speakers on policy issues included Ashindi Maxton, an independent strategist in democracy reform, racial justice and education, as well as Sandy Sorenson and Rev. Michael Neuroth of the Justice and Witness Ministries of The United Church of Christ. Opportunities for networking by denomination and by state and local regions allowed advocates to be briefed on the EAD’s 2016 Congressional advocacy Ask, which focused on efforts to restore key protections of the Voting Rights Act recently invalidated by a decision of the Supreme Court, and to oppose the pending Trans-Pacific Partnership trade agreement in Congress due to significant issues regarding economic injustice and environmental considerations which remain unaddressed in the current agreement. The event concluded Monday, April 18, as the advocates moved from their conference location to Capitol Hill to join in prayer at a vigil held on the lawn of the Capitol to various meetings with Senators and Members of Congress throughout the day. They were supported in their visits with a coordinated call-in to Congressional offices from remote advocates who joined their voices in the calls for justice. Photos from Friday, Saturday, and Sunday of the National Gathering are now available, along with photos of EAD’s Monday Lobby Day. 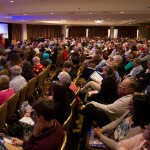 Videos of the plenary speakers and panels, as well as the celebration and worship services will be added in the coming days and weeks, along with other written resources from the event. Learn more about and download our 2016 Lobby Day Ask and resources. The National Gathering portion of Ecumenical Advocacy Days 2016 – “Lift Every Voice! Racism, Class and Power” – concluded on Sunday, April 17 with an interdenominational worship, the “People Power Around the World” plenary, state break-outs, and issue and advocacy skills training workshops – all capped by a closing celebratory banquet. Ecumenical Advocacy Days 2016 – “Lift Every Voice: Racism, Class & Power” – kicked off Friday, April 15 with a series of pre-events, orientations and other welcome activities, followed by an opening celebration spotlighted by a rousing keynote from Rev. Dr. William Barber. The program also included global songs for peace and justice from the ELCA Glocal Musicians.